Growing a baby in the age of the smartphone comes with the added feature of week-by-week tracking apps. Since pregnancy takes a while and it's nice to know how things are shaping up inside I quite like these. Most of the apps will make weekly comparisons to common objects so you can imagine how big the baby is - fruit is the most common, so you'll progress through grapes, apricots, and apples right up to watermelon at the end. Last week the baby was apparently the size of a flaugnarde (pronounciation guide here), which I had never heard of. A quick Google told me that flaugnarde is essentially the same as clafoutis - which is to say, a sort of baked custard with fruit in it - but clafoutis should be made only with cherries, whereas flaugnarde can be any fruit. Given that my "clafoutis" used plums I guess I have already made flaugnarde - but since the chocolate one was awesome and I was keen to try a more traditional recipe I decided to whip up a summer berry version. This is a rustic-looking dessert and it won't come out of the baking dish intact, so for maximum pretty factor a round ceramic baking dish is likely your best bet. Having said that, I used a regular cake tin and none of the eaters were complaining - it's always nice to serve up pretty food (I think) but taste definitely comes first and this flaugnarde delivers there. It also delivers on simplicity - five minutes to combine the custard ingredients in a bowl and chop strawberries, and a two-stage (but still easy and hands-off) baking process and you're done. You can chop and change the fruit but make sure it's not too wet - I used frozen raspberries, which worked well but they need gentle handling to keep them as intact as possible. You can also use extra milk in place of the cream, but the end result will be a smidge less rich - I reckon it's nicer with the cream but if you have everything else in your fridge already you can sub it out. So tell me, what's the strangest place you've ever found baking inspiration? Grease a 23cm cake tin or flan dish. Heat oven to 180 C.
Beat together the first measure of sugar, milk, eggs, lemon zest, salt and flour until well combined. Pour about 2/3 of the mixture into the prepared tin or dish and bake for 10 minutes. 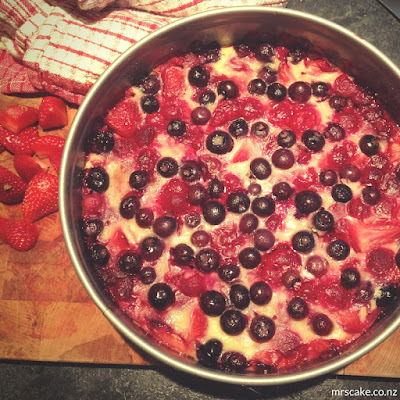 Remove from oven and sprinkle fruit and remaining sugar over the top, then add the remaining batter. Return to the oven and bake for a further 50 minutes or until set (if you wobble the dish and nothing moves it's ready). Dust with icing sugar just before serving; serve warm with ice-cream or cream.